The three drivers with the longest commutes had the best fuel economy, averaging almost 60 mpg. 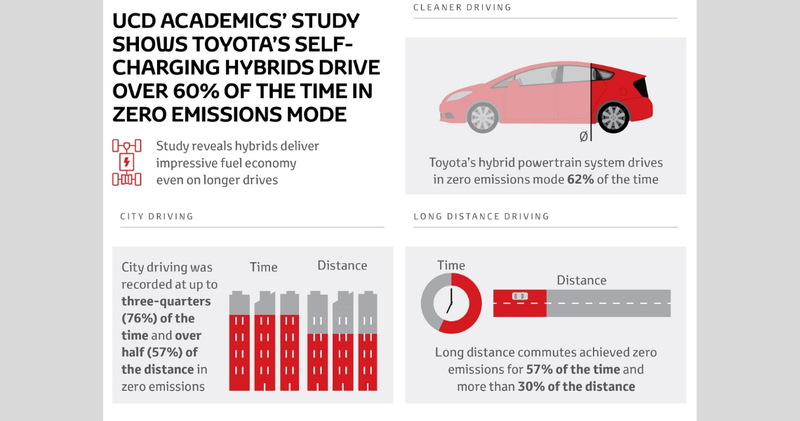 A new study carried out by University College Dublin (UCD) academics, which was published today, has revealed that in typical Irish commuting conditions, Toyota’s hybrid powertrain system drives in zero emissions mode (ZEV) for significantly more than half (62%) of the time and over 40% of the distance covered. Those were the key findings of a study carried out by four UCD academics and commissioned by Toyota Ireland through ConsultUCD, the University’s managed consultancy service. The study entitled "Energy Behaviour of Toyota Prius Hybrid Vehicles in Sample Irish Commuting Conditions" was authored by Professors Robert Shorten and Giovanni Russo, UCD School of Electrical and Electronic Engineering, Professor Franceso Pilla, UCD School of Architecture, Planning and Environmental Planning and Professor David Timoney, UCD School of Mechanical and Materials Engineering. The study tracked seven drivers who commuted to UCD, Belfield from Drogheda, Wicklow, Aughrim, Smithfield, Blackrock and Dundrum (2), over a full week each during last November, combined with normal additional family driving. Conclusions are based on the analysis of the more than 2,000 kilometres of driving across motorways, rural roads and city driving that resulted. The routes reflect typical Irish commuting conditions. The researchers measured the time the cars spent in zero emissions mode versus internal combustion mode. No restrictions or driving guidelines were given to the drivers. 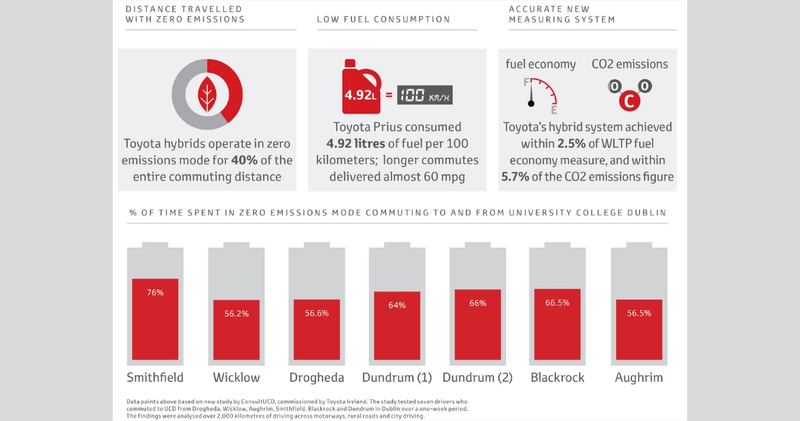 Commenting on the study, Toyota Corporate Affairs Director, Mark Teevan, said the UCD study confirms that Toyota Prius hybrids spend the majority of their time in zero emissions mode and provides vital learnings for Ireland as the country sets about decarbonising the Irish car fleet. The study sampled a number of journeys that reflect typical urban, outer suburban and provincial driving conditions in Ireland. It showed that for the journey from Smithfield to UCD, the self-charging hybrid was in zero emissions mode on average three-quarters (76%) of the time and for over half (57%) of the distance, while drivers from Dundrum and Blackrock were in zero emissions for two-thirds (64-67%) of the time of their journey. Meanwhile, the commuters from Drogheda, Aughrim and Wicklow town to UCD spent over half (56%) of their time in zero emissions mode over the respective 644 km, 452 Km and 293 Km driven over the course of the week’s testing. The study also revealed that, on average, fuel consumption for the Prius was 4.92 litres per 100 kilometres (57 mpg) and average C02 emissions were 114.2 grammes per kilometre. The three drivers with the longest commutes had the best fuel economy, averaging almost 60 mpg, a fact that clearly demonstrates the merits of hybrid cars for long distance driving. Interestingly, the study also provides an early validation of the new EU-mandated vehicle test regime (WLTP), since the results achieved closely match the official figures for both fuel economy and CO2 emissions (calculated) for the Prius. Toyota are the first vehicle manufacturer to have removed diesel passengers cars from its line-up and this year over 80% of its car sales in Ireland will be self-charging hybrid models in keeping with its promise of “Built for a better World”. The Prius IV is the first production iteration of both Toyota’s fourth generation hybrid powertrain and of its new global architecture. Toyota Ireland has announced it intends to commission similar tests later this year with the new hybrid models that are being launched through the first months of 2019. Toyota to share its innovative Toyota Guardian safety technology Toyota pledges to make available its new innovative Guardian safety technology to all manufacturers The 2019 Prius makes its debut at the Los Angeles Auto Show The new 2019 Toyota Prius makes its public debut at the Los Angeles Auto Show January Toyota Hybrid Roadshow Announced Customers and new car browsers can get an exclusive first look at the exciting new range of Toyota’s self-charging hybrids. Toyota Ireland Dealer of the Year Awards 2018 Toyota Dealers from across Ireland gathered in Dublin for the annual Toyota Dealer of the Year Awards.